I am joining in with Chari @ Happy to Design for Sunday Favorites. 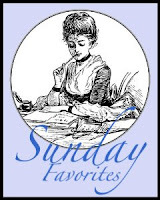 Thanks to Chari for always being there for us on a Sunday to let us have a day of posting without the rush. This is a story about my mom. Although parts of this story may seem sad it is actually isn't. I learned a lot from my mom. She died when I was 25, before my kids were born. She had always had a pretty rough life and seemed beaten down a good portion of the time. We will go back to the year 1969, Christmas time. I was 13. One of my sisters and my brother chipped in their money to send my mom and me from British Columbia back to Ontario to visit our eldest sister who lived there with her husband and kids. They didn't have enough money for a plane so we were traveling by train. They also didn't have enough money for a berth so we were going to sleep in our seats. For 3 nights. The food at the diner counter was pretty rough looking. The only thing they had that seemed decent was some pea soup. Breakfast, pea soup. Lunch, pea soup. Dinner, pea soup. My mother finally had enough of this but had such a tight budget I didn't know what she could do. She brought me through the train cars, past the luncheon counter further and further until we got to the dining car. Train travel back in those days, when you had the money was very elegant. The tables were set in a fashion that would give Bill or Susan a run for their money on Tablescape Thursday for sure. She hustled me over to one of the beautifully set tables. The table was set with icy cold water filled crystal glasses, crystal dishes filled with olives and celery and other tidbits to nibble on. White linen napkins starched into perfect folds. A silver basket lined with a white napkin held some yeasty warm breads and the butter pats were close by molded into shells on their silver plates. "Quickly" she said. "have some bread and butter" She tore some bread and managed to get the crumbs on the tablecloth. On purpose. "Have some olives and celery" she said while drinking from the crystal glass. Slowly down the aisle way came the conductor. He was chatting with the patrons. I ate some olives. Closer he comes, I drink some water. Finally he reaches our table. He asks my mother to see her ticket expecting (or not) to see a first class ticket which would entitle us to be in the elegant dining car. She hands him our tickets and he says, of course, that we are not supposed to be in the dining car. Really? she asks. Oh my I didn't realize that. The conductor eyes the table in front of us. They would have to completely redo the table if we left. He decided that we could stay and we ordered our dinner. I think the only thing I recognized on the menu was a steak so that is what I had. I don't remember what my mother had but she enjoyed every bite of it. Well this story almost has a happy ending. Remember this was the first solid food I had eaten in a couple of days. The train was shaking back and forth. I could feel it slowly coming back up and I excused myself quickly from the table. I raced out of the dining car and into the first bathroom I could find. I threw up my entire dinner as the train jolted me from side to side. It was a colossal mess and I took off back to our car as fast as I could. I was so embarrassed. The next morning I went to get some pea soup from the luncheonette and they were all out. What a nice memory Lori, except for the throwing up your steak part. Your Mom sounds like a wonderful lady. Loving your vacation photos too. Looks like you had a great time in the Bay Area and Carmel. That was the greatest story! I enjoyed it thoroughly!!! I remember this story, very touching! Did those people just forget to lock up their garlic store, or what? The beads; i don't know what happens if they get wet but I do know that a little dampness won't hurt them. They are pretty hard. What a fun memory. Quite the tale to tell through the years. I can just see you retelling this over and over, laughing, and knowing your mom is nearby laughing, too. What a great story Lori. The throwing up part wasn't nice, but you tell it so well! What a great memory - the good & the bad! Oh my WORD!!!! What a story. So glad you retold it, for I believe I missed it the first time around. I would LOVE to take a bit of a travel by train - - - just for the FUN of it. Ahhh...such a sweet story and memory, my friend! All except for the part about throwing up...poor girl! 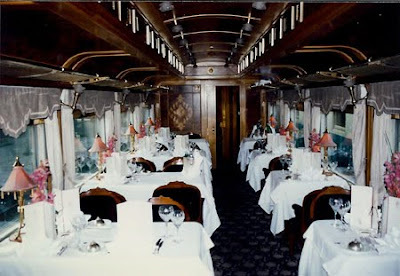 I have been on a few trains in my life but honestly, I don't remember eating on any of the trips! Not sure what that's about...the food must have not been very impressive and of course, I never had a first class ticket! Hehe! You know, the thing that I "took away" from your story was this...mama's always have a way of taking a situation and making it "all better"!!! Yep...mama's are like that...yes, they are! I'm sorry that you lost your mama while you were so young, my friend! I still have my mama with me...although she lives in Texas and I don't get to see her as often as I would like! My husband Russell...lost his mother when he was 25 as well...before he had his children. That always makes him sad! On a happier note...that sure was sweet of your brothers to chip in and gift you and your mama...tickets to go and see your sister! That was awesome!!! Thanks so much for sharing this sweet memory and story with us today for Sunday Favorites, Lori! Have a wonderful week, dear lady! This was a great story, despite the ending, but that makes it all the more interesting. When I was a child we used to travel by train from California to Georgia each summer. I loved every minute, but one year my parent's bought a station wagon that could travel that far without breaking down. It was a shorter time to get to Georgia, but just like the train, it didn't make many stops, daddy wanted to get there. As an adult I finally did the trip one time and took three weeks, so I could see and touch everything. Now that's how I like to travel! Memories are such a fine treasure to have regardless if one is rich or poor. Thank you for sharing yours.